Chesterville Village offices are located at 99 Mill Street, Chesterville, OH 43317; phone: 419-768-3447. Photo: Enos Miles House, ca. 1830, 154 South Portland Street, Chesterville, OH. Listed on the National Register of Historic Places in 1979. Photographed by User:Nyttend (own work), 2010, [cc0-by-1.0 (creativecommons.org/publicdomain/zero/1.0/deed.en], via Wikimedia Commons, accessed October, 2015. Chesterville is the first and oldest community in Morrow County. It was surveyed by Joseph Vance in 1807 and the next year the first settlers arrived. Evan and Charity Holt were the first white inhabitants of the new town. After the War of 1812, the little settlement began to grow. Most of its early inhabitants were of Welsh ancestry. In 1812 Chester Township was formed and elections were held. Enos Miles, surveyor, teacher, innkeeper and businessman, arrived in the area around 1815. Fifteen years later Miles laid out the new village, which was named after the township. The major route for travel was a north-south corduroy road on the site of the present Route 314. Miles' imposing house still stands at the southern edge of town. It was during the period before the Civil War that Chesterville achieved significance. Several private educational institutions were established, attracting people from a broad area to the town. A four story brick building was erected in 1838 by Enos Miles as an academy with hopes of establishing Chesterville as a major educational center. A carding mill was erected that turned out attractive coverlets with a distinctive emblem and the town's name on them. These coverlets are highly prized today. Many fine homes were erected in the 1830's and 40's. A popular inn was established and operated for many years by the Miles family. Two fine churches were erected during this period. The beginnings of Chesterville's decline can also be traced to this pre-Civil War period. In 1845 a campaign began for the creation of a new county in this area with Chesterville, Marengo and Mount Gilead each competing for the county seat. Finally in 1848, a compromise was reached between the Mount Gilead and Marengo supporters with the new county of Morrow established, shrewdly named to honor Governor Jeremiah Morrow, and Mount Gilead chosen as the county seat. The railroad bypassed Chesterville in favor of the new county seat. Thus, Chesterville declined and Mount Gilead prospered. In plan, Chesterville is quite simple. Route 95 is the major east-west road and goes from northwest to southeast through the town. Route 314, the major north-south road, is also at an angle, passing through the town in a northeasterly to southwesterly direction. It has a broad curve south of Route 95. The side streets of Chesterville are small and alley-like, forming small square blocks. Few houses and no commercial structures are located on these streets. No public square or other open space is present in the town. Chesterville is entirely residential except for the cluster of commercial buildings at the center. Perhaps the finest grouping of residences is along Route 314 south. Numerous Greek Revival and Italianate houses exist along this pleasant tree-lined street, but, like much of Chesterville, they are often not maintained and are deteriorating. Two outstanding Greek Revival houses are on this street. The first is a two story five bay structure on the east side just south of the center. It has a bold, massive entablature and a central front entrance ornamented by pilasters and an entablature. On the west side, on the southern edge of town, is Chesterville's finest and best preserved Greek Revival house. 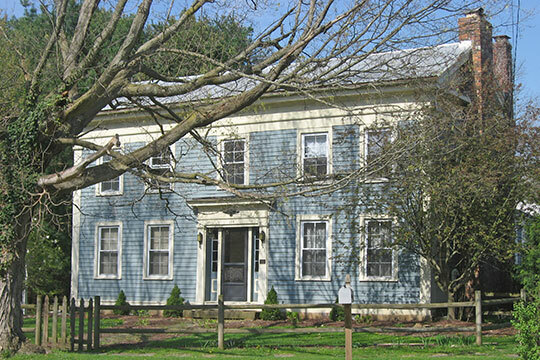 It is similar in ornament to the previous house and other Greek Revival buildings in town. Among its major features are a full articulated north pediment, finely crafted interior stairway and elaborate front entrance. Steven McQuillin, Regional Preservation Office, Ohio State University, Mansfield, Chesterville Multiple Resource Area, Morrow County, OH, nomination document, 1978, National Park Service, National Register of Historic Places, Washington, D.C.